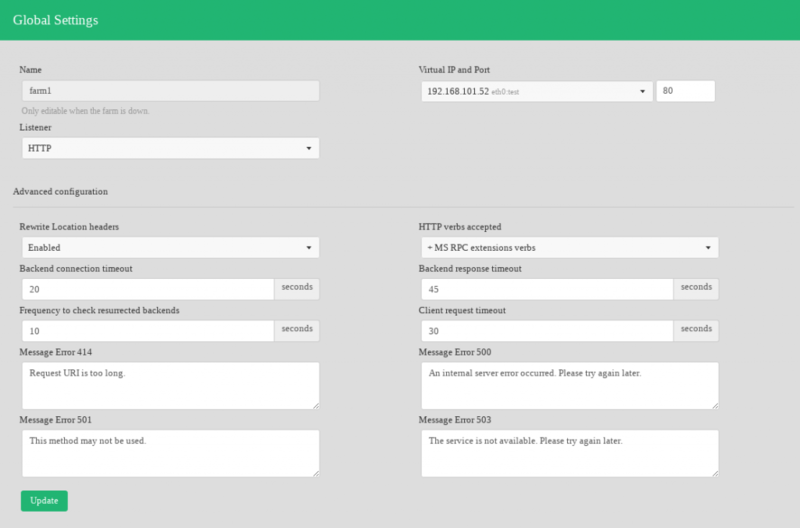 When modifying any parameter in a HTTP/S farm through the Update green button at the bottom, it would be needed a manually restart in order to apply the changes, so a message will be shown at the left bottom of the page to alert the sysadmin that there are global parameters or backend changes that needs to be applied via a farm restart. The system administrator is able to modify whatever parameters are needed and then restart the farm service to apply all of them at the same time and when the time is more suitable. It also can be done manually using the Actions if needed. Those color codes are the same all over the graphical user interface. Every HTTP(S) farm (or virtual service) is able to manage several web services through the same HTTP farm like a reverse proxy, therefore one HTTP virtual IP and port could handle more than one load balanced web service. For that reason, a service under a HTTP farm is a concept that offers the virtual host flexibility and then a list of backends will be shown for each service created. Certificates Enabled. The SSL certificates in this list will be the certificates that the farm will be able to manage.